U.S. Atty. Patrick Fitzgerald filed a motion Wednesday asking for a 90-day extension to return an indictment against Gov. Rod Blagojevich and his chief of staff John Harris to review an avalanche of potential evidence. Under federal procedures, the government has 30 days to obtain an indictment through the grand jury after filing a criminal complaint. The governnor was arrested Dec. 9 on a criminal complaint. The four-page motion filed in U.S. District Court in Chicago indicated that prosecutors needed more time to review “thousands of phone calls intercepted between late-October 2008 and early December 2008”. It also said “multiple witnesses have come forward in recent weeks to discuss their knowledge of criminal activity in relation to the ongoing investigation” that has gone on since 2003. “The government cannot complete its investigation and appropriately conclude the investigation within the time allowed,” the motion said. The motion asks that the government have up until April 7 to file the indictment. 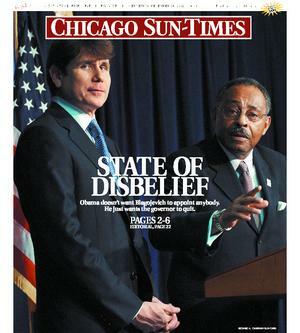 Blagojevich has publicly denied any wrongdoing. Posted: 12/31/08 at 1:52 PM under News Story.